Who would ever have thought that eating pizza and tomato-based pasta sauces and regularly enjoying a slice of watermelon could cut the risk of cancer? Well, according to a Harvard University study, having 10 servings per week of tomato products could cut the risk of prostate cancer in particular by 38 percent. That’s because tomatoes are rich in lycopene, a bright red carotenoid, or organic pigment, which is considered a potent and powerful anti-oxidant. It is found mainly in tomatoes, but also in other fruits and vegetables such as watermelon, pink grapefruit, carrots, and red peppers. An anti-oxidant is a molecule which stops other molecules from oxidizing, which is a type of chemical reaction. When there is an oxidation reaction, free radicals can be produced, which eventually can damage cells. 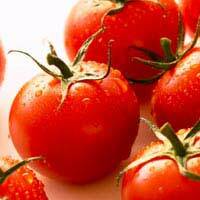 In other words, anti-oxidants, such as the lycopene found in tomatoes, help prevent cells from being damaged. Another term for anti-oxidants are “free radical scavengers”, and studies have shown that eating them on a regular basis can be beneficial to your overall health, and keep certain chronic diseases such as cancer at bay. In fact, a survey reviewing over 72 studies on lycopene concluded that the more people ingest tomatoes and tomato products, the less likely they were to suffer from certain cancers, specifically cancer of the lungs, stomach and prostate. A diet that is high in lycopene can not only inhibit cancer, but also help prevent cardiovascular disease, according to studies. One study found that men with a high concentration of lycopene stored in their body fat were less likely than other men to suffer from heart attacks. New research is also pointing to lycopene being beneficial when it comes to male infertility, as well as bone and skin health. If you are not a natural fruit or vegetable eater, there are subtle ways to increase your lycopene intake naturally. So subtle, in fact, you may not even notice you’re eating it! Add small pieces of chopped carrot to chilli con carne and other stews or casseroles. Make fresh fruit juice or a fresh fruit smoothie and add watermelon to the usual components, such as bananas and strawberries. Use tomato paste or puree as a base for pizzas, pasta sauces and other savoury dishes. Instead of just having tortilla chips with hummus or other dips, slice up small pieces of carrot and red pepper as well. Go wild with ketchup (reduced-sugar and reduced-salt ketchup will have the same effect). It is recommended that people have at least 35 grams of lycopene in their diets daily to fight chronic disease. That is equivalent to two glasses of tomato juice or roughly two servings of tomato-based products. Lycopene can also be taken as a dietary supplement, but studies have concluded that consuming tomatoes and tomato-based products will have a better effect on your health than taking supplements containing lycopene. Make sure you consult your doctor beforehand if you have a medical condition, are pregnant or are taking any other supplements or prescribed medications.